She just blends in with all the snow. Soooo cute. 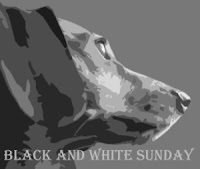 It is more white than black this Sunday at our house - yours too it looks like! We found you on the blog hop! Hi! Looks cold, but fun, out there! You sure are cute! I love how white dogs disappear in the now. It's much more noticeable in black and white photos too. Nice shots!